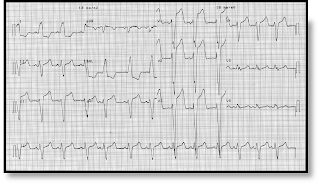 One of the commonest questions I get asked is whether it's possible to diagnose an acute ST-segment elevation myocardial infarction in the presence of pre-existing left bundle branch block (LBBB) on an ECG? Students are often taught that LBBB precludes analysis of the ST segments, but that's not really true. In short, it can be possible to diagnose MI in the setting of LBBB, and to do so we use the Sgarbossa criteria. The Sgarbossa criteria are based upon the principle of 'appropriate discordance'. 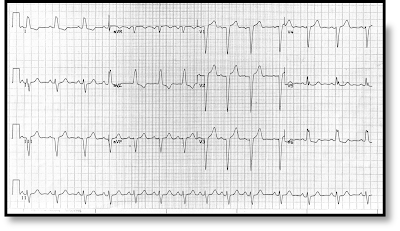 Normally, in LBBB, any ST segment deviation in a particular lead will be in the opposite direction to the QRS complex in that lead. In other words, if the QRS complex is negative, then any ST segment deviation will be positive (upright). Conversely, if QRS complex is positive, then the ST segment deviation will usually be negative (depressed). 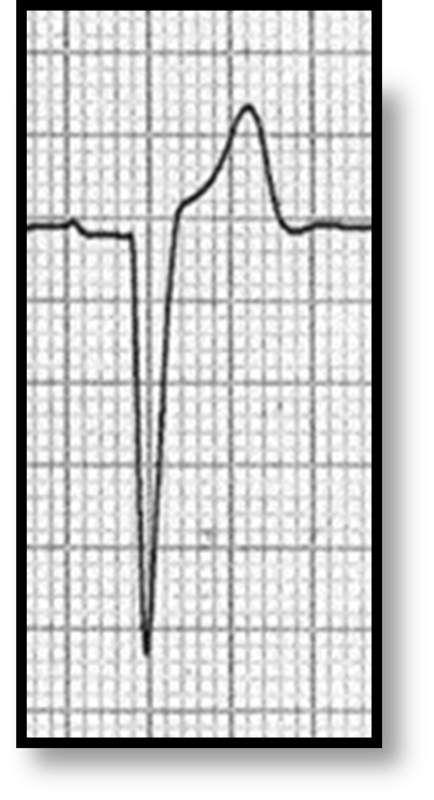 Normally, then, we see 'discordance' between the direction of the QRS complex and any deviation of the ST segment in LBBB (Fig. 2). The first two Sgarbossa criteria are based on exceptions to this rule - they're looking for ST segment elevation in leads with a positive QRS complex, or ST segment depression in leads with a negative QRS complex. In other words, they're looking for evidence of 'concordance' instead of the normal discordance. In the example shown in Fig. 3, in leads V1-V3 the ST segments are elevated by >5mm above the isoelectric line - this therefore meets criterion #3 of the Sgarbossa criteria, and this ECG would score 2 points. A modification to this third criterion has been proposed, in which the criterion is met if the discordant ST segment elevation is ≥25% of the depth of the preceding S wave. Using this modified criterion, instead of the "≥5 mm rule", the sensitivity for detecting acute MI is increased. 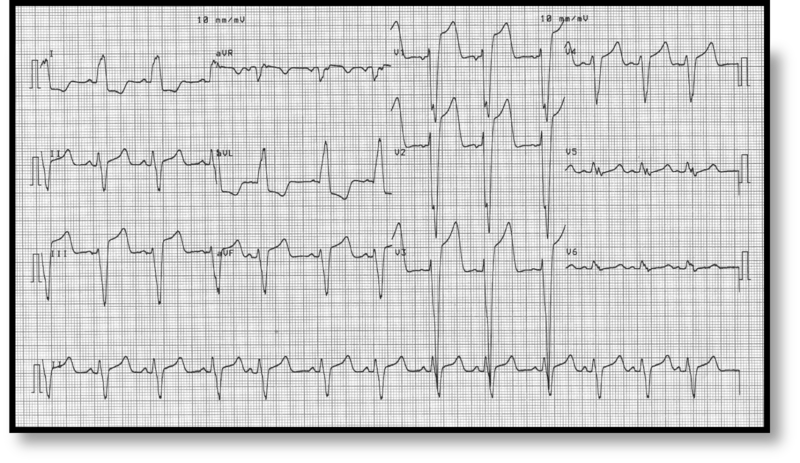 The Sgarbossa criteria can also be used in cases of right ventricular pacing (where the paced QRS complexes have an LBBB pattern), but in this situation the criteria are less specific for the diagnosis of acute MI. Sgarbossa EB et al. Electrocardiographic Diagnosis of Evolving Acute Myocardial Infarction in the Presence of Left Bundle-Branch Block. N Engl J Med 1996; 334: 481-487. Smith SW et al. Diagnosis of ST-Elevation Myocardial Infarction in the Presence of Left Bundle Branch Block with the ST-Elevation to S-Wave Ratio in a Modified Sgarbossa Rule. Annals of Emergency Medicine 2012; 60: 766-776. An excellent three-part article on the Sgarbossa criteria by Tom Bouthillet. Sgarbossa Criteria at the always-excellent Life in the Fast Lane website. Sgarbossa Criteria calculator on MDCalc. Andrew R. Houghton MA(Oxon. ), DM, FRCP(London), FESC is a Consultant Cardiologist based in the United Kingdom. His principal interests are cardiac imaging (echo & CMR) and medical education. He is the author of the Making Sense series of cardiology textbooks, and is a faculty member at Medmastery. What structure are we looking at here? Am I okay to go on holiday, doctor? What do we mean by 'rate control' in AF? What is the Ashman phenomenon?